This wet/dry combo is the perfect combo for any occasion. 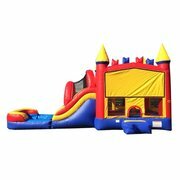 this unit provides jumping, sliding, climbing, pop-out obstacle poles and a basketball hoop. This unit is all around fun!! !